College, for many, is a time when young adults do a lot of experimenting. This can be natural but also can lead to very unnatural behavior. College drinking is still a major problem on college campuses and many engage in dangerous binge drinking. 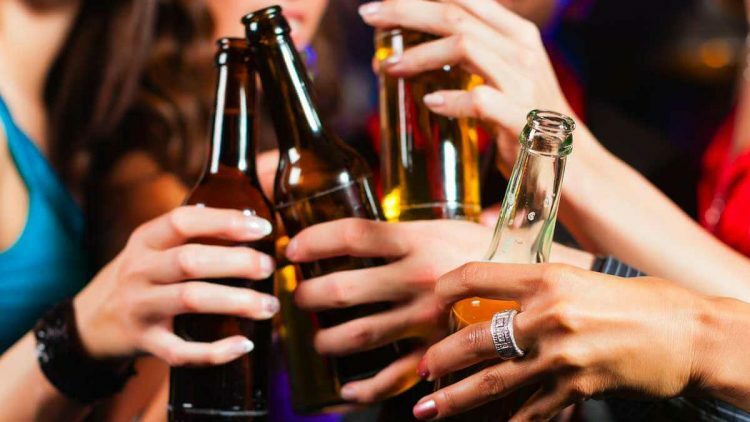 According to the National Institute on Alcohol Abuse and Alcoholism (NIAAA), 1 of every 4 college students reports alcohol directly causing academic consequences and about 20% already meet the criteria for Alcohol Use Disorder. College drinking can be fun but at what point is it unnatural, and at what point is someone at a higher risk of developing an addiction? There are many factors that put a person at a higher risk of addiction. Risk factors can be psychological health, the environment/lifestyle, and even genetic. These all come into play when trying to figure out if one has a substance abuse problem. Anyone can be at risk of college drinking addiction, but some are more so than others. These are some specific factors to be aware of. If you have been diagnosed with a mental health disorder like depression, bipolar, or anxiety you are at a higher risk of addiction than those who have not had these diagnoses. Heavy drinking mixed with medications can also lead a person down a dangerous path. Most people who attend drug and alcohol treatment centers have some other underlying mental health disorder. Using multiple drugs at once or mixing drugs with alcohol also increases one’s risk on becoming addicted. Using drugs consistently, or using drugs to combat hangovers, reduces the negative side effects of using substances (“come downs”). This can enable a person to use on a more consistent basis and lead to dependence or addiction. Adderall has become extremely popular on college campuses. Many students are beginning to abuse the drugs to complete homework faster, study for finals, or finish last minute papers. Adderall can be extremely addicting and if done consistently one may soon find they cannot function without the drug. Using pharmaceutical drugs not as prescribed puts a person at higher risk of developing an addiction. Those who drink underage are at a higher risk of developing an addiction later in life. Using drugs and alcohol while the brain is still developing can permanently affect neurotransmitters that are responsible for feelings of happiness, reward, and ambition. Over time drugs may seem needed to be content in life. This can quickly spiral into a full blown addiction. Regularly binge drinking has a high risk of developing into an addiction. Many college-aged people are unaware of the true definition of binge drinking in college. According to the NIAAA, binge drinking is a pattern of drinking that brings blood alcohol concentration (BAC) levels to 0.08 g/dL. This typically occurs after 4 drinks for women and 5 drinks for men—in about 2 hours. This means drinking to get “drunk” on a consistent basis is not natural or healthy. The recommended safe drinking guidelines are 1 drink per hour. Though this is not a direct cause or risk factor of addiction, schools with a strong Greek life and/or sports programs tend to have more binge drinking and alcohol-related injuries. With more binge drinking comes more negative consequences caused by alcohol abuse. These schools have higher rates of alcoholism and drunk driving accidents. Drinking and drugging for people that are very nervous or shy can be risky. Alcohol and drugs lower inhibitions and relax nerves. They can make the very quiet and reserved be outgoing and extroverted. This can be an addictive feeling for those who struggle to fit in without drugs or alcohol. There are many clubs on campuses and finding people to relate to (other than drugs or alcohol) can help prevent addictive behavior or consistent abuse. Even if everyone else around you is drinking and drugging consistently, this does not mean it is normal. Missing classes due to drinking or drugging can be a serious risk factor. One of the criteria for drug or alcohol abuse disorder in the DSM-V is missing responsibilities or commitments. If drugs or alcohol begin to interfere with school or other commitments, you may have a current or looming substance abuse problem. If you find that you cannot stop, you may have an addiction. In all, everyone is at risk of alcohol and drug addiction. While in college it is more prevalent than other scenarios. It’s okay to have fun while in college. As a matter of fact, it’s expected. Keep in mind of the factors above and you’ll gain an advantage to surviving college addictions. Sam Knight is in long-term recovery from addiction. He is now the Outreach Director for DetoxLocal.com, where he writes and develops educational material about addiction. In his spare time, he helps others achieve sobriety and volunteers at a local Harm Reduction Initiative in South Florida.